The Proto Rail is for the serious competitor, featuring Fuse Bolt Technology, operating at 145 psi . Color coded o-rings for simplified maintenance, and a host of other features make the Rail the gun of choice. The durable Rail solenoid features consistent airflow with a dwell of 18 milliseconds. The small, light Hyper3 In-Line air regulator provides high flow and smooth velocity adjustment, with non-slip grips. The ultimate in ergonomic comfort, The Ultralite Frame is equipped with an adjustable Reach trigger. The solid construction consists of an aluminum body, bolt, Ultralite Frame and trigger. The Rail comes with a precision honed two piece 14 inch barrel, durable zippered gun case, parts kit, Dye Slick Lube, barrel sock, allen key set and 9-volt battery. 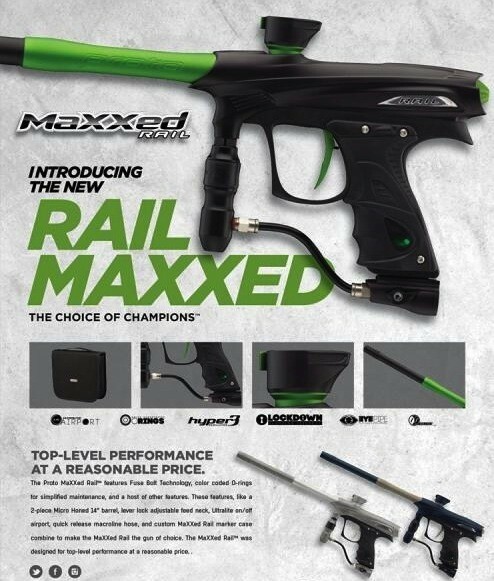 The Rail weighs in at 1.94 lbs.The Eye Pipe, patent pending, internal design houses multiple critical systems that ensure worry free performance. The poly carbonate pipe shields the self-cleaning anti-chop eye system from dirt and broken paint ensuring the eyes are always monitoring the breech and ball drop. The seamless pipe is wiped clean by the bolt tip o-ring on every cycle. The Eye Pipe system eliminates miss feeds and double feeding.